Thanks to everyone who made it to the re-creation of the Annapolis chapter of the Coastal Conservation Association (CCA) at the Boatyard Bar & Grill last night. There was a big turnout and we had a lot of fun. As I was driving to the meeting, I considered the concept of re-creating something as significant as a major chapter in a national conservation group. It’s obviously an important event, so I decided to collect my thoughts on the concept of re-creating. I looked up the word recreation and found that it simply means to create something anew. I suppose almost everyone who reads this website considers themselves recreational fishermen. The time we spend on and around the water helps us wind down and relax. So by fishing, we’re essentially restoring ourselves to a state-of-mind that makes it easier to face the daily challenges life throws our way. The craft of conservation is also about re-creating. Groups like CCA seek to create a culture that protects the fish we like to catch. This fish first approach means that we want the species we target to reproduce and thrive so their populations are continually re-creating themselves. When the re-creation process is healthy, we can be relatively assured that future generations of fishermen will have enough fish around to experience this sport we enjoy so much. Simply put; if there are fish, our sport will be safe. Unfortunately, there are times when our interests as fishermen conflict with our interests as conservationists. We all want to go out on fishing trips and catch fish, and I don’t know of a single fisherman who doesn’t want to catch BIG fish. December is the time of year when we have huge cow rockfish in the Chesapeake Bay and anglers have a chance to catch the fish of a lifetime. 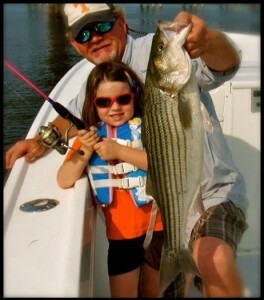 There’s nothing more thrilling than landing a 30- or 40-pound striper. Some lucky anglers will even catch 50-pound-plus fish this fall. Now that’s something to brag about. Ancient Chinese Proverb: “Bragging may not bring happiness, but no man having caught a large fish goes home through an alley.” I couldn’t agree more. When I catch a big fish, I’m usually shouting about it to the high heavens! This year we are seeing a very encouraging trend on the Chesapeake as more and more anglers are releasing the big cows they catch. Even some tournament fishermen are keeping their fish alive and releasing them after they are weighed. My hat is off to those guys. Harvesting big female rockfish can be especially detrimental to the population. A 30-pound striper can produce 1.5 million more eggs than a 10-pounder. Big migrating stripers don’t taste as good as smaller fish, and they probably shouldn’t be eaten. 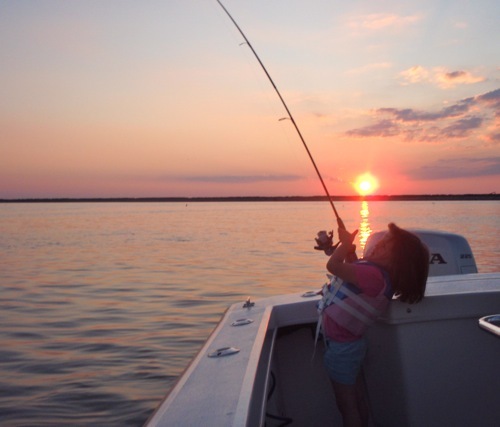 According to a recent advisory posted by state agencies up and down the Atlantic seaboard including the Maryland Department of the Environment, coastal striped bass contain high levels of PCBs, mercury, and other toxic substances. Pregnant women, women of childbearing age, nursing mothers, and children 6 and younger should avoid the fish altogether. Yet, fishermen routinely kill the big fish and take them home to feed to their families. An option to catching and killing trophy fish is to take pictures. It’s said that a picture is worth a thousand words. In the case of a carefully-handled and released migratory rockfish, a picture is also worth a thousand fish, or more. A digital photograph is excellent proof of a successful catch. Trust me, you can brag all you want when you have a good picture of a big fish. It’s also all you need – along with a couple of measurements for length and girth – to create a lifelike fiberglass wall mount. These replicas often look better and last longer than traditional taxidermy, and come with the added satisfaction of knowing that your trophy fish is still repopulating the Bay. 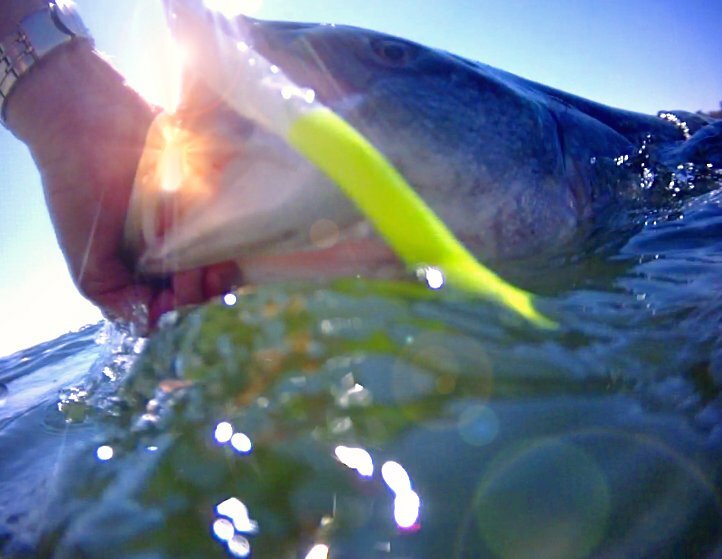 It’s incredibly fulfilling to catch and release a trophy striper. Part of that fulfillment is the knowledge that we are preserving and re-creating our valuable natural resources and contributing to the sustainability of the species we catch. Releasing a beautiful fish to live and swim away freely is the pinnacle of sportsmanship and one of the most satisfying experiences of life. If we put the fish first it’s more likely that our children and grandchildren will be catching them for years to come. I don’t know about you, but in my book, preserving and protecting the sport we love is what truly makes a fisherman recreational. Stay tuned. 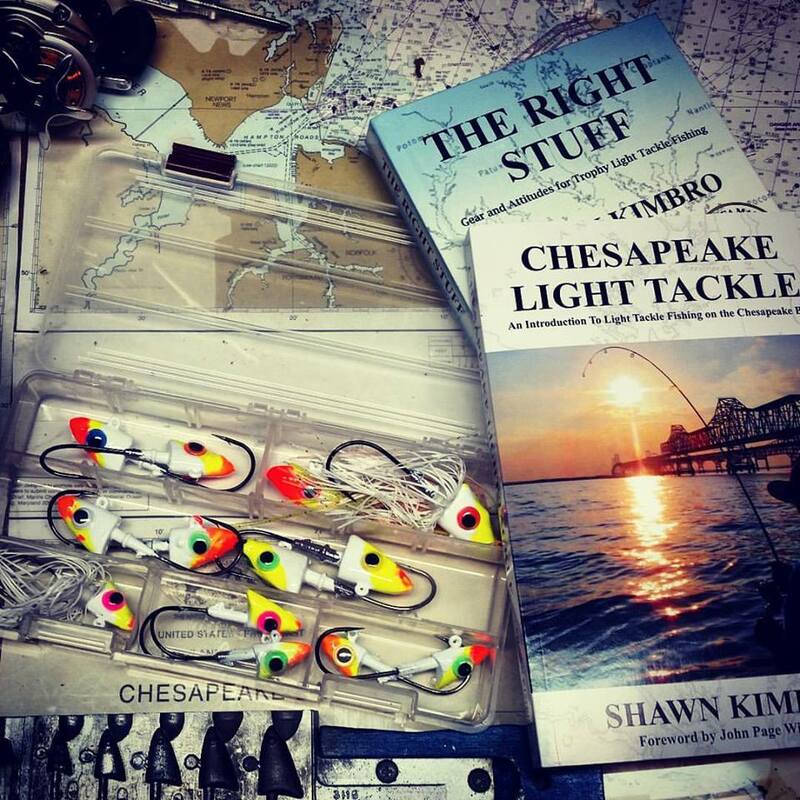 I’m recovering from my book-releasing responsibilities and I’ll be back with a Chesapeake Bay fishing report in just a few days! I really enjoyed your talk at the CCA meeting, I am not currently a member but will be soon. I will aslo spend my winter reading and re reading your book and continue reading your site with hopes of becoming at best, a decent fisherman. Shawn; this is another great article. And the Boatyard event was one of the best I’ve had the pleasure of attending. “Pregnant women, women of childbearing age, whiskey drinkers, nursing mothers, trollers, and children 6 and younger should avoid the fish altogether.” Excellent advice. So there should be none of the above down south this weekend. I can’t wait to see your next report. Reading the first paragraph and the play between recreation and re-creation dredged up some old church camp sermons you gave, at least I think it was there. Anyway, powerful memory for a split second, then it was gone. Gonna drive me crazy. Great article. Can’t wait for this weekend. Daniel..looking forward to meeting you this weekend..
Shawn…great talk last night…the ride home thru annapolis with Rich was a different story..first time I have ever been standing in front of 3 officers ready to draw their weapons? To bad they don’t make all of the big money fishing tourneys C/R…though it was encouraging to read lately that a few use the striper tubes..for easy live releases…see ya this weekend.. I could not agree more. Thanks for another inspiring entry. great to see you inprint again. I like the trumpet you are sounding about releasing the big cows very much. Let’s hope that others buy into the sweet music! It’s almost as sweet as bluegrass ! Thought that might get your attention ! Outstanding Mr. Kimbro. It was a pleasure meeting you at the Boatyard Bar and Grill last night. Once again, you have said what hundreds of Maryland “re-creational” anglers are feeling. Re-creational anglers…I like it.Im digging that water level fish pic too,very cool shot! Great post. I particularly enjoyed the proverb, as well as the conservation aspects. Your book order link worked well. The book arrived yesterday. Working my way through it and alreary picked up some additional great insight. Very well done. Had some barbless hot-rodded jigs based on your website “recipes” ready for last Srping’s tidal Potomac striper run, but high water conditions at Fletchers coincided with when I could have fished. Will try again Spring 2012. If you happen to see a 20′ Grady walkaround by name of “Fishhawk” with a bow-mounted trolling motor working the Bridge (or Fletchers) in the Spring, that would be me. Planning to try some of the jigs at several of the artifical reef structures we put in when I managed the reef program while with Md Environmental Service. From underwater video, some of the structures, including Reef Balls we introducted to the program, attract stripers. Slowly building up reef profiles with my Humminbird during the few times during the year I have time to pull over to the Bay from Northern VA. PS – This banjo picker recreational fisherman is happy that WAMU finally put bluegrass back on the FM at 105.5.